Notes: Blencow or Blencowe is a small village near Penrith, Cumbria. It is divided by the River Petteril into Great Blencow to the south and Little Blencow to the north. Great Blencow is in the civil parish of Dacre while Little Blencow is within Greystoke parish.The village takes its name from the Blencowe family. Adam de Blencowe was awarded land by Edward III in 1358 and the original family home was built in Great Blencow. Now little remains. Subsequently in the 15th or 16th century the family built a new home, the current Blencowe Hall, just to the west of Little Blencow. 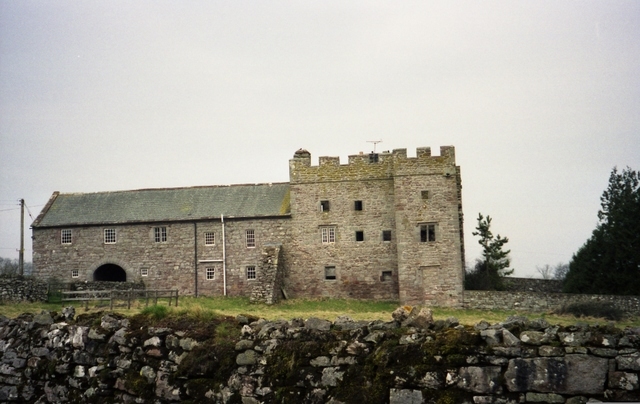 It consists of two fortified pele towers joined by connecting buildings. It sustained substantial damage during the English Civil War, now evident externally as a deep gash on the front of the western tower. This was imaginatively restored in the late 20th century. The family continued to own the hall until 1802, when it was sold to the Duke of Norfolk. There is an active Blencowe Families Association who celebrate their connections with this village. "Blencow Hall" britishlistedbuildings.co.uk. Retrieved 2011-03-08.